One of the benefits of doing numerology and psychic readings in Brisbane, is that I analyse names and dates of birth (lifepaths) for a living. So when it came to giving my baby bump (see his cute ultrasound on the right) a nickname, my partner and I followed our intuition. We came up with the names Forest, or Forrest, as we love the bush and trees. Not only do these words add to Master Number 11 (my lifepath), my last name Yip means ‘leaf’ in Chinese, and his father Kris grows bonsai. Kris is my Soulmate – we met after I had a dramatic breakup on 11.11.11, at a palmistry talk (see the video). Both of us see 11:11, which represents new beginnings, the Age of Aquarius, and the equality of all Souls. 11 forms a bridge between Heaven and Earth, and even looks like an equals sign on it’s side. 1+1+1+1 = 4, and the 4th Chakra is our Heart Centre. So 11:11 is a wake up call from Spirit, asking us to grow to our full spiritual height, similar to trees in a forest (see photo). Can you see the forest for the trees? 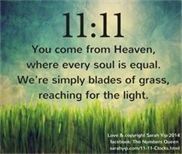 11:11 is about seeing the bigger picture – that, despite our differences, we are all energy beings wanting to evolve. Everyone is a teacher and a student in different areas. When we die, our bodies are ‘recycled’, like leaves on the forest floor, but our essence stays alive. The day that Kris and I discussed the first name Forest for our son, we talked about what spelling he would prefer. Imagine our delight when, that night, we turned the television on to the opening scene of Forrest Gump, the heartwarming movie with Tom Hanks (I love his quote ‘Like is like a box of chocolates’. I’m used to synchronicity, so was amused rather than amazed – I figured that Forrest’s Soul was simply helping us out! Even better, a week or so later I was listening to the radio when the presenter mentioned an Australian businessman called Andrew Forrest. I thought ‘there’s that spelling again’. The very next day, I received a ‘spam’ email, supposedly from Andrew Forrest. Kris also met a guy called Forrest (!) So from then on, Kris and I knew that Forrest was the winner. I had been calling him ‘The Bump’ so ‘Forrest Bump’ was an easy change. A similar series of ‘coincidences’ helped my sister to name her son Phoenix last year. Even her sceptical husband noticed how often they were seeing ‘Phoenix’ on TV, or on signs. Phoenix suits his name to a tee, as his arrival was a huge rebirth for our family. As an aside, I won’t be finalising Forrest’s full name until he is born (he ended up telling me his middle name a few weeks after he was born, through telepathy). The reason for this is that, in numerology we believe that you should select a baby’s name in relation to their date of birth and lifepath. Find your lifepath. Being a true nerd, I’ve already created a spreadsheet with Forrest’s possible lifepaths, but it’s up to him exactly when he’s born. Although I am a fan of natural, drug-free birth, I don’t believe we should feel make people feel guilty for having a caesarean section. Part of being a conscious parent is making the best choices we can, based on what we know at the time. Similarly, have fun choosing your baby’s name – it’s not rocket science. Just keep an eye out for signs and clues. Pray or meditate for guidance (see tips). Keep a list of names that keep popping into your head, as they are probably coming from your baby’s Soul. Remember that your child will have free will to change their name as an adult, if needed. All names take time to grow into. I used to hate Sarah because it was so common, but I now like it, as people can spell it and it helps me to stand out in the psychic industry, where so many people use pseudonyms. Hopefully Forrest will love what we choose for him, too! I believe that we all come from Heaven, and have Divine wisdom to impart.